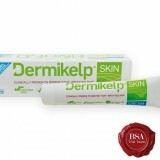 Dermikelp product range contains kelp, clinically proven to rapidly relieve skin irritations associated with eczema, contact dermatitis, seborrhoeic dermatitis and insect bites. It’s cortisone free, suitable for all ages including babies. It is available over the counter without prescription.